The building that houses the Holocaust Museum & Center for Tolerance and Education might be closed for renovations, but the Museum’s educational programs are in full swing. 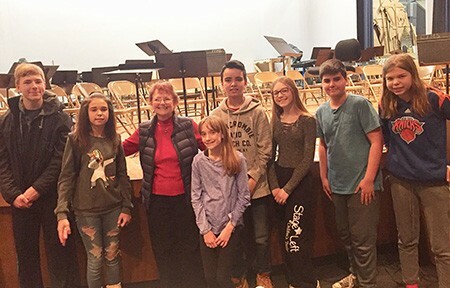 Holocaust survivors who have joined the Museum’s Speaker’s Bureau have been out in the community, speaking at a number of schools throughout Rockland and neighboring counties. The speakers teach lessons of tolerance and respect for all, and Federation is proud to support them through a grant to the Museum made possible by generous Federation donors. At Felix Festa Middle School in West Nyack, Holocaust survivors shared their personal stories and important lessons with the school’s eighth-grade students as part of a Social Studies unit on World War II. Herta Sprechtman addressed a group of students during the last period of the school day, on an unusually warm day in February. The fact that the dismissal bell would soon ring did not distract the students from Herta’s incredible story. Herta was born just months before her family was forced to abandon their home and move into a Jewish ghetto. As a baby, Herta was carried in her mother’s arms on a week-long Nazi death march. When her grandmother fell during that march, Herta told the students, no one saw her again. When Herta’s older sister grew ill in a forced labor camp, her mother snuck out to a nearby village to exchange links of a necklace for medicine. The Museum encourages school districts and community organizations to schedule visiting speakers. “Old and young alike can learn from the lessons of the Holocaust, to create a society of mutual respect and understanding,” says Museum Director Andrea Winograd. To schedule a speaker visit, please e-mail holocaustrcc@gmail.com.